So we thought it was a good thing that April 1st fell on a weekend this year, because we wouldn't have to deal with as many hilarious fake stories. We were wrong, because for one California newspaper, the inconvenience of the calendar just meant that Friday was the day for a prank, a fake article so subtle that the writer didn't even tip off the newspaper. India's foreign minister of natural resources recently announced a cooperative exchange between his country and the California Department of Fish and Game. Needing a viable predator to control the mahseer, a large carp-like game fish from the Kashmir River in Uttarakhand Province located at the foot of the Himalayas, internationally famous fisheries biologist Pasloo Flir announced the exchange of 5,000 adult Florida bass for 2,000 sterile Himalayan Greta trout. The Greta, capable of growing to over 50-pounds, will be planted on an experimental basis in Isabella, Castaic and Silverwood Lakes in an effort to control squawfish and the common carp and to also provide unheralded recreational opportunities. "We expect the fish to be air freighted and then planted by Sunday, April 1st," Flir noted in a recent interview. "Most of these fast-growing fish will weigh between 5 and 10-kilos (7.5-25-pounds) when released, but should attain weights in the 15-kilo range (35-40-pounds) by early next year." The Greta Trout, well known in Nepal, India and northern Pakistan for its incredible leaps and bull dogging runs, fights especially hard when caught on appropriately light salt water tackle. Some reports claim the toothy fish has been known to attack wading or swimming humans, although there is no definitive proof. Still, anglers are warned to stay out of the water. Californian editors on Friday determined that an item in Friday's Outdoors column, by Steve Merlo, was a complete fabrication. 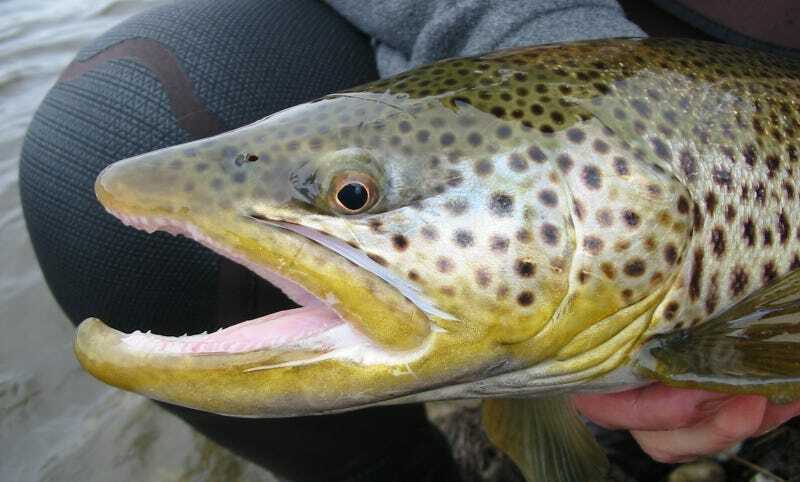 The item — "Foreign trout species to be planted in Isabella Lake" — has absolutely no basis in truth and should be disregarded by anyone who read it. The Californian fully retracts the item. I apologize to all readers who were misled by this report and to all who expect, as we do, that the paper will strive to meet a higher standard. The paper throws Merlo under the bus, making him out to be an angling Mitch Albom who willfully misled his newspaper and his readers. Sure, Merlo deserves censure, if only for making an April Fools' prank on March 30th. But the Californian has the ultimate responsibility for anything that runs in its pages, and running Merlo's column without checking it out first is an institutional failure, and a not-so-funny prank on its readers. Gotcha! We clearly haven't factchecked this column in years!